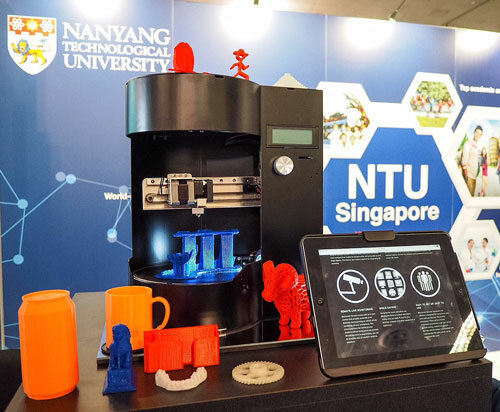 (Nanowerk News) Nanyang Technological University’s (NTU Singapore) start-up Blacksmith Group today launched the world’s first compact 3D printer that can also scan items into digitised models. Named the Blacksmith Genesis, this user-friendly device allows users without much knowledge of 3D software to scan any item, then edit the digitised model on the computer and print it out in 3D. The all-in-one 3D printer and scanner whose production was financed through a crowdfunding campaign on Indiegogo.com, was unveiled today at the American Association Advancement of Science (AAAS) Annual Meeting in San Jose, California. The event is the world’s largest general scientific conference, bringing together thousands of scientists, engineers, policymakers, and educators to discuss the most recent developments in science and technology. The first batch is now ready to be shipped out in March to early adopters who supported Blacksmith Group’s crowdfunding campaign. Housed in a black aluminium casing, the high-tech device weighing 6 kilograms features a 2-inch LCD display, Wi-Fi, an integrated SD-card reader and a USB connection for instant printing. Blacksmith Genesis uses an innovative rotary platform for its printing and scanning, unlike other commercial 3D printers. This patent-pending revolving platform allows for true 360-degrees scanning, and can print items up to 6,650 cm3 (about 6.5 litres), twice the size of those printed by other similar-sized 3D printers in the market. With a fine resolution of 50 micrometres, the reproductions will be twice as detailed compared to other compact 3D printers. Likewise, scanning of objects with its 5 megapixel camera takes only 6 minutes, twice as fast as other 3D scanners in the market. Blacksmith Genesis is also the first to feature remote live monitoring and automatic error detection thanks to its in-built camera. This allows users to monitor and control the printing process on their smartphone from anywhere in the world through the Internet. The device is the brainchild of Blacksmith Group’s founders, NTU engineering graduate Dr Alex Pui Tze Sian and Mr Fang Kok Boon. Mr Fang, CEO of Blacksmith Group, said their aim is to make 3D printing easy and accessible to the average consumers. “We designed Blacksmith Genesis with the average hobbyist in mind. Most 3D printers sold on the market now are not really user-friendly as their 3D models and blueprints usually have to be designed from scratch on the computer. Mr Mark Reilly, a resident of Iowa in the United States, will be the first customer to receive the Blacksmith Genesis. Mr Reilly said he liked the fact that Blacksmith Genesis was an all-in-one unit, which meant he did not need to purchase multiple items to get all the features he wanted such as printing, scanning and copying. The Blacksmith Group is currently incubated at NTU Singapore, a young and research-intensive university that is ranked No. 1 globally amongst universities below 50 years old. The company is mentored by NTU Singapore’s Professor Chua Chee Kai, the world’s most cited scientist in the field of 3D printing based on data from Thomson-Reuters. “3D printing is a disruptive innovation that has revolutionised the manufacturing and biomedical industries,” Prof Chua said. “While low-cost 3D printers are available, they are still very hard to programme and assemble. Having an affordable, high-quality 3D printer that is easy to use is what the market is missing and this is where Blacksmith Group will bridge the gap,” he added. The start-up had successfully completed their crowdsourcing campaign last August, raising over US$80,000. It is funded by the Interactive Digital Media (IDM) Jump-start and Mentor programme (i.JAM), and the National Research Foundation, Prime Minister’s Office, Singapore. The Blacksmith Genesis is now available for pre-order online at the price of US$2,200, with a flat rate of USD$150 for shipping to 70 countries worldwide. The pre-order site was launched today, at www.blacksmith-group.com/pre-order/.